How does diet influence land requirements for food production? How many people could be fed through local and regional food systems? 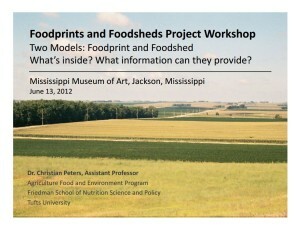 Dig into research about foodprints and foodsheds in Michigan, Mississippi, New Mexico and New York. Learn more about ways the relationship between diet and land can create a more sustainable food system. Read the latest news about foodprints, foodsheds and sustainable food systems.